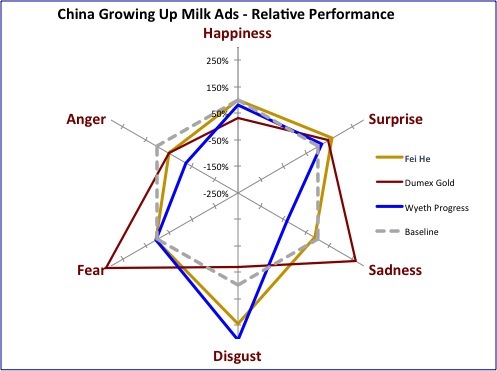 Firstly, look at the chart below, which shows the relative emotions evoked by three Growing-Up milk ads tested, benchmarked against all Chinese ads (the grey dotted line). You can seen that they are not particularly positive in relative terms, and evoke some relatively strong negatives. In particular, note the higher relative levels of Fear and Sadness for Dumex and the similar level of Disgust for Feihe and Wyeth (NB the sample base for Growing-Up analysis was Mothers with children drinking Growing-Up milk – so the emotional response is not because they don’t care!). 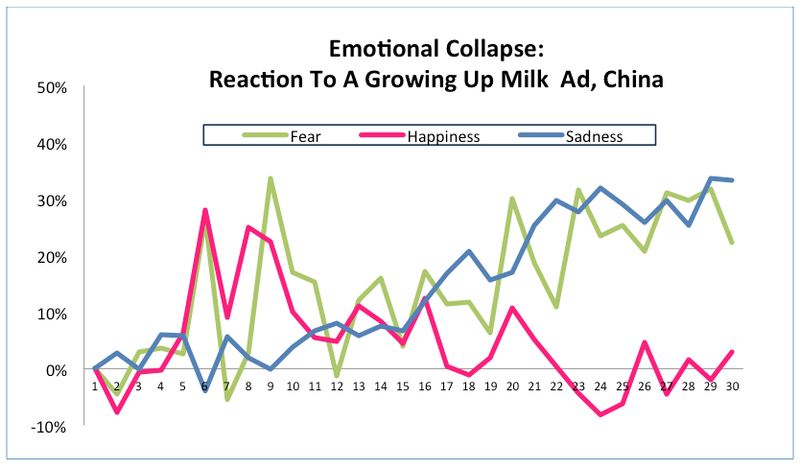 Overall, it looks like a category with issues, and indeed no Growing Up milk ad in China was classified as “Best Practice” in our analysis – meaning that none of them were above average on both emotional and rational criteria. This implies that even before the current problems, consumers’ underlying engagement with, and acceptance of, ads in the category was poor. Drilling down into the ads shows that many of their issues start as they begin to focus on outlining their benefits and advantages. 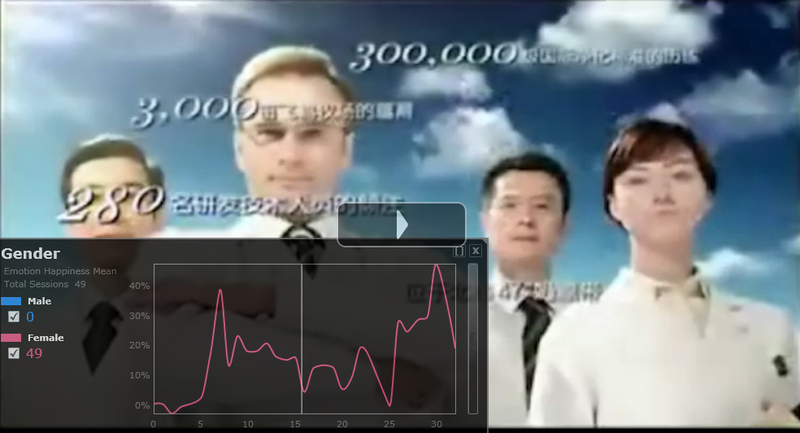 The screenshot at the top of this article is from the Fei He TVC, an ad that starts by showing pictures of cows in a green natural environment, but then moves rapidly to introduce international looking experts and a series of facts designed to show the scale of support and capability backing up the Fei He brand. As these key ‘facts’ unfold emotional engagement actually dissipates, making it unlikely that the messages will be retained, and increasing the chance of channel surfing. 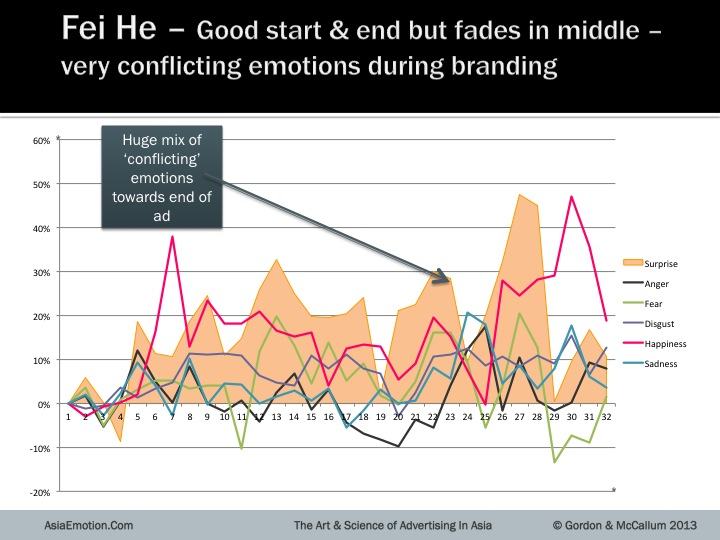 The Fei He commercial does end fairly positively as shown in the slide below, but it also has a period of wildly conflicting emotional response , during key branding moments, near the end. The combination of low engagement in the crucial ‘reassurance” period with these mixed emotions implies to us that it’s key messages are less likely to be absorbed. A similar phenomenon occurs with Dumex, where an initially engaging scene (involving a toddler and a garden sprinkler) is followed by an animated pie chart and recitation of ingredients and benefits. 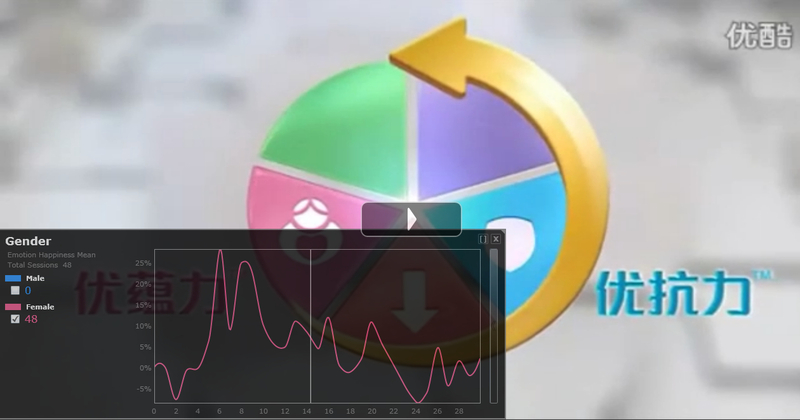 The result, as shown in the screenshot below, is a major decline in in positive emotional response. However, the Dumex ad goes a step further in trying to ensure viewers focus on their message: the last third of the ad is simply a logo with a voice-over that outlines the virtues of the brand. The following chart shows the result of this single minded focus on rational message over creative content: from the 20th second, reaction to the ad is dominated by apprehension and sadness. While a Growing-Up milk ad may sometimes need to raise apprehension (e.g. if outlining a problem) or even show sad scenes, the place for this is not when you are trying to convey the quality and reliability of the brand. Indeed we concluded that the particular combination of emotions evoked at this stage (which include Surprise, not shown below) are likely to reflect disappointment and mild feelings of despair/concern. Given this voice-over aims to establish Dumex as a ‘gold standard’ thoroughly reputable brand, this reaction is alarming and potentially damaging to its equity. The bottom line is that messages from both these ads, while seeking to reassure mothers about brand reputation, are unlikely to have been absorbed (in the case of Fei He) or (for Dumex) may even have damaged emotional response to the brand. Mothers’ reaction to issues surrounding their baby are primarily emotional. Purely rational messages are doomed to cause glazed eyes. (I am talking here of “post-crisis” times – obviously in the midst of a health scare like the current one, mothers will be doing more active information seeking and will be more ready to absorb details, although I’d argue the key response remains emotional). Emotional response however, is not independent of rational information gathering. Mothers clearly discuss baby formulas, ask health professionals, and read ingredients on packets. But we know from a variety of research that emotional response helps us select what information to look for, how we value and compare different sources of information and what information is likely to be transferred to long-term memory. Generating a sustained emotional response involves far more than simply showing “emotional images” or targeting “relevant” needs. Manufacturers often mistakenly think their ads are “emotional” because they show obviously emotional scenes. Alas, as we’ve pointed out in previous articles, it’s not that simple. Mothers usually like cute babies and showing a picture of one will often generate a short spike of positive response. On its own such “scene specific” reponse won’t be sustained however, and if every brand is showing similar babies it simply won’t have cut-through. Asian mothers are increasingly sophisticated, educated consumers who don’t want to be lectured any more. Experts, lists of ingredients and recitation of facts about the brand are just no longer as engaging as they may once have been. Emotional sequencing matters. Effectiveness is enhanced by integrating message, voice-over and emotive elements into a clear narrative generating a logical sequence of emotional response. Most growing-up milk ads in most markets fail to do this. (There are exceptions). So what are the implications for brands that have to convey information to restore their reputation or communicate some key information? At times like this, companies will have many “facts” that they dearly want to get out there, but after the first flush of media interest is over, simply reciting these details will just not cut through. Key messages have to be integrated into mainstream marketing, and they will need to be more emotionally driven than has been the case for this category in the past. Clearly, some ways to introduce emotional narratives into communications are not approriate in the setting of a food scare – humour is unlikely to be appropriate for instance! But some emotional hook that makes people take notice and gives credence to the message is vital. “Facts” need to be integrated into a story with a clear theme that can be easily followed. One key, perhaps unpalatable, point is that conveying information in a form which modern Asian consumers will absorb emotionally requires creative subtlety. All our research across multiple categories indicates this is very easy to get wrong and that every brand needs to assess second-by-second emotional response to their communications rather than relying on what consumers “say” in response to standard survey questions. The good news, however, is that there are best practice examples of brands who have conveyed facts and benefits while simultaneously generating the kind of emotional cut-through that will get those messages absorbed. So, as dairy food manufacturers refine their plans to cope with consumer anxiety in their fastest growing markets, they would be well advised to reconsider the conventions of the category and to explore new approaches to conveying their brand’s equity and reliability. This entry was posted on Wednesday, August 7th, 2013 at 3:43 am and is filed under Advertising Research, Consumer behaviour, Emotion Research, Neuroscience, Research Methods. You can follow any responses to this entry through the RSS 2.0 feed. You can leave a response, or trackback from your own site.